Seniors left to right: Jordan Rife, Isabel Stoffel, Breanne Groves, Roberto Calderon, Justin DeLano, Justin Parrett, and Bobby Gaylor. 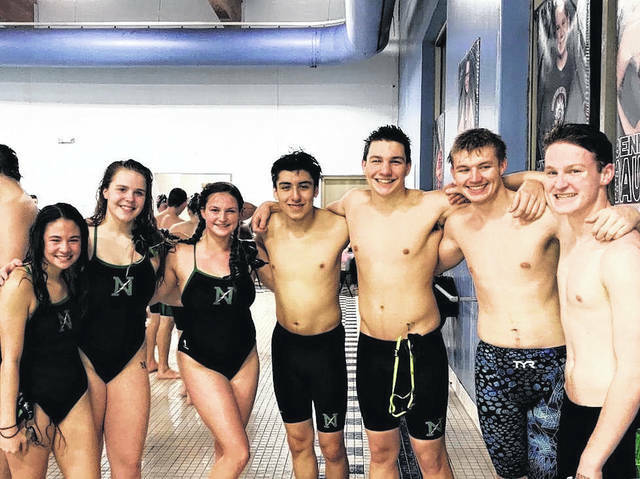 HUBER HEIGHTS — On Sunday, February 4, Northmont swimmers competed against five other area high schools at Wayne High School’s sprint invitational. Since it was a sprint meet, all races were 50 yards, except two 100 yard races – the individual medley and the 100 yard freestyle. Northmont placed first with 581.5 points. Bethel was second with 442.5 and Wayne came in third at 434.5 points. Unlike other swim meets, Wayne organized this invitational by year, so each swimmer only competed with others in his or her grade level. Swimming in the 100 yard freestyle, freshmen Phoebe Caraway and Jonah Scoville placed third and first, respectively. For the sophomores, only the girls placed, with Abby Gutierrez taking first and Jasmine Johnson, third. The junior boys took both second (Mitchell Asbury) and third (Eric Woods) places. Northmont’s seniors took first and second in both the girls’ and boy’s races, with Isabel Stoffel and Justin Parrett placing first and Jordan Rife and Justin DeLano taking second. In the other 100 yard race, the individual medley, Jonah Mergler took first for the freshman boys. For the sophomores Abby Gutierrez took third and Joey McKarns, second. In the junior competitions, Fynn Roberts placed first and Josiah English, second. Both Isabel Stoffel and Justin DeLano took first in the seniors’ races. Stoffel and DeLano also took first in the seniors’ 50 yard butterflies. Freshmen Jonah Mergler and Jonah Scoville took first and second, respectively, for Northmont’s boys. Sophomore Lindsey Dresnek placed third in the girls’ race, and junior Josiah English, first, in the boys’. Swimming the 50 yard backstroke for the girls, Phoebe Caraway took third in the freshman race, Lindsey Dresnek took third for the sophomores, and Jordan Rife placed second for the seniors. For the boys, juniors Mitchell Asbury and Eric Woods took second and third, respectively. Seniors Bobby Gaylor and Roberto Calderon took first and third, respectively. In the 50 yard breast stroke, freshman Allison Jackson placed second and junior Fynn Roberts, first, in the girls’ races. Sophmores Joey McKarns took second, and Nick Sanders, third, in their race. Seniors Justin Parrett finished first and Bobby Gaylor, second, in their race. Finally, freshmen Phoebe Caraway and Jonah Mergler placed first in the 50 yard freestyle, while Jonah Scoville took third. Sophomores Lindsey Dresnek and Joey McKarns both placed second. Junior Fynn Roberts took first for the girls. Northmont’s junior boys swept their race, with Josiah English taking first, Mitchell Asbury, second, and Eric Woods, third. For the seniors, Jordan Rife placed second in the girls’ race, while Justin Parrett placed first and Bobby Gaylor took third in the boys’ race. Northmont’s swimmers next competition will be sectionals on February 9 and 10.